From making room for new books to getting rid old text books, selling books is a perfect way to get some extra cash. 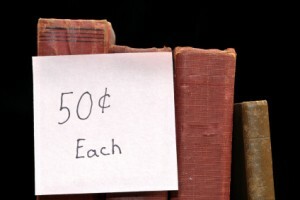 Whether online or at a garage sale, there are many ways to sell your old books. This is a guide about selling books. This really isn't a pointer on selling your old books but it is an option if you are an avid reader with lots of paperback books. There is a club online called paperback swap and you can visit it at paperbackswap.com. The premise is that you post your paperback boks for trade. As people select your paperbacks, you mail them to the other member. You pay for the shipping. Once they have the book and post receiving it, you get a credit. With this credit, you can look through the database. Select a paperback of your choosing and it gets mailed to you. You pay nothing, they pay for shipping as you did with the book you sent. That is the basic premise, there may be a few more details. Visit their site and check it out. I use two of their sister sites and one works just as I explained above. The other charges a small fee (probably to cover site costs) but it is still worth it. On their Swap A CD site, I have been able to get CDs that are almost impossible to find to buy. You may find a book impossible to buy. I went through my books and DVD's and had some electronics I no longer use. I have made several hundred dollars by selling them on Amazon and eBay or try craigslist! I have a 25 volume set of Britanica encyclopedias. I want to get rid of them, but don't know exactly where or to whom I should sell them. Any suggestions? Hi - It is sad but you may find it difficult to even give this set away. Most libraries will not even take them for a book sale as very few people will even look at a set anymore. You might try Craig's list or Free Cycle as they would be very expensive (and a lot of trouble) to ship a set like this. Some people use them for crafts. Probably nobody wants them but your local recycling company might recycle them. I am looking to sell an entire library of books left behind in the house my husband and I purchased. How do I start the process and who might be interested in them? It is a very large variety, from antique encyclopedias to late novels. You might try selling them in "batches" on Ebay. Try a box of mysteries or historical novels. Not too many per box for the sake of postage. You could also put them on amazon. I'm not sure how that works for sellers but I have bought a lot of books from them. You could look under books in the phone directory. They may have a classification of old books under the books heading or you could, as I did, go to google and type in used book stores in Murrieta California. There was a list of used book stores. I had some old books that I took to used book store. The owner knew a lot about books. Mine were not worth anything. You should go through each book to see if money was left in any of them. Happens more than you'd think. Also I have heard of people finding important letters or even a " Deed "to property in one. Encyclopedia sets, no matter the age are worthless. ( Our Library,Thrift stores will no long take them for FREE ) But you might find a first edition ( or classics ) among the books. It is a good idea to go through each one to see if there is money. I used to hide money in my books all the time and would at times even forget about it. As far as selling your books. Check for first editions (especially the older books, those with dust jackets in good condition are good too.) Right now eBay has a no-fee listing that you might try. Search to see what your book may be worth - or what others are asking for their copy. You can also try used book stores to see what they will give you for your books. I am messaging you with a question. Here is a link that you can use to find out what your books are worth and where you can sell them. I use Amazon and Half. No complaints here. Any ideas how I can make money from my used books? They are in excellent condition, they haven't been opened or read. I've tried all the buy back companies that I am aware of, with no luck. Can anyone suggest any other sites? Most second shops or Charity shops buy books.or take it to the Flea market. My daughter has the hardest time selling her college books back every semester, and I spend over 100 dollars for them too. It's ridiculous at her school. That's what came to mind when I thought of your question, but have you tried eBAY? Check amazon, ebay, and any similar sites (you can google "sites like ebay" for a list) for the books you want to sell. Write down the highest and lowest prices they are being sold for (noting condition they're in), and sell them accordingly. To increase potential for a sale, sell them at a lower price than the lowest you found on any of the sites. Pricing them between lowest and highest, according to condition (i.e., poor - new, yours sound "like new"), might also be smart. I used to sell a lot of books on eBay, but with the present economy, that hasn't worked so well. However, I do notice that eBay has free listing now, though I don't know for how long. Another option, besides garage sales, is to take your books to a used book store. They will generally give you in cash about 1/4 of their worth. What I do is "trade" the books and I will get at least 1/2 of their worth or more. The book store will start an account for you and you can use that account to buy more books. I collect older books and a few of the newer authors. This has worked out very well for me. I'm basically trading my books for what I want - which is other books. I'm lucky in that I live close to a larger town that has many, many used book stores and if one book store doesn't want all my books, I just go to the next one. I've had over $100 in accounts in just two to three book stores. And that amount will stay there until I use it. I have actually bought nice books for 25 or 50 cents that I already have or have read or that I know the book store will buy. Just to take them to the book store to trade in for books I want. Those 25 or 50 cent books will actually give me $8 to $10 credit. When you do this a few times, you will learn what the book stores are looking for. For instance, we have one used Christian book store in town so I know that I can't take an R-rated book to that store; however, they accept nice children's books, old classics and children's classics and the more G-rated and PG-rated books. I know books don't have a rating, but hopefully you see what I mean. If they're old, perhaps you might check your local antiques dealers? If they're rare, check rare-book shops. They should pay more than used book shops. I have a large collection of books I was given in a deceased estate. There is a great variety of both English and German books. There are encyclopedias, cookbooks, and other collections. I am looking for a site that I may be able to sell these on. The ages vary, many of them are from before 1970. If you have barcodes on the books you can look them up on Amazon and sell them there. The listing will also have other sellers with the same book for sale the condition they rate their book and what they are asking as a selling price. This is an easy way to see if your book has value. If you don't have a bar code you can still try Amazon but it may take more searching to find exactly what you have. Another option is Craigslist. A third option is PaperbackSwap.com. On PaperbackSwap you can list your books and people don't buy them they request them. You pay for shipping the book and then, once the book is received, you get a credit. With this credit you can request books for yourself and they cost you nothing but the credit. If you aren't into books (including audio books) you can join SwapaCD or SwapaDVD and transfer your credits from the PaperbackSwap site to the other Swapa site to pick out items on those sites to b sent to you. I'm sure there are other sites you could possibly sell on but I am not familiar with them. What you can do is go to Google or Bing and do a search for a title you ant to sell and see if a site pops up that may have your book and allow you to sell yours. Your other option is just to pack everything up and try a used bookstore. Your books will have some value, although depending on the book, maybe not a lot. Your encyclopedia likely have no value. There are countless posts on this site from people who wish to sell them, and unless they are over 100 years old, usually you can't give them away. I inherited my mother's book collection over 30 boxes worth. I went through every book writing down all ISBN numbers I found. You can look the ISBN up online to see if the book is worth selling. I looked into selling on Amazon and I am too busy to focus my attention being a seller. Craigslist is also an option like Suntydt mentioned. Some book collectors and stores will buy rare and 1st editions. I donated my encyclopedias and reference books to my local library. I know some places you can receive store credit for books. If you are wanting money, I would do your research and don't rush. Call around your area for book sellers, dealers and bookstores. How can I sell old World Book encyclopedias? I'm sorry but 99 % of the time these of no monetary value. Thrift stores around me won't even accept them as a donation. I have a set of books I am interested in selling. They are over 230 years old and it looks like the best way to find someone interested in them would be some sort of online transaction or auction website. The name of the set is not really important, just note that they are very old and bound in leather, it is also a particularly large set. I suspect these books have value, but I am nervous about selling them to a stranger online. How can I sell these books and rest easy knowing I won't be scammed? I am particularly nervous about receiving the money as I don't want someone to retract the payment somehow after they get the books in the mail. Any information or advice from people with experience would be greatly appreciated. I have a complete set of the Great Books (First Printing 1952). There are 54 volumes and it comes with a bookcase. It is in great condition. I am wondering where I can sell it and if it is really worth anything. Post your ideas for selling used books below. I have an account with Half.com and I sell (and purchase) used books and textbooks. I have been pleased with the site so far. I have a full set of Britannica encyclopedias from 1-24, plus A-Z dictionaries, and the atlas. I would like to sell them, but am not sure where the best place is to go. Could you advise me please? Well, best of luck trying to sell them. I would start first with Craig's List. Then I would try a pawn shop (which is iffy). 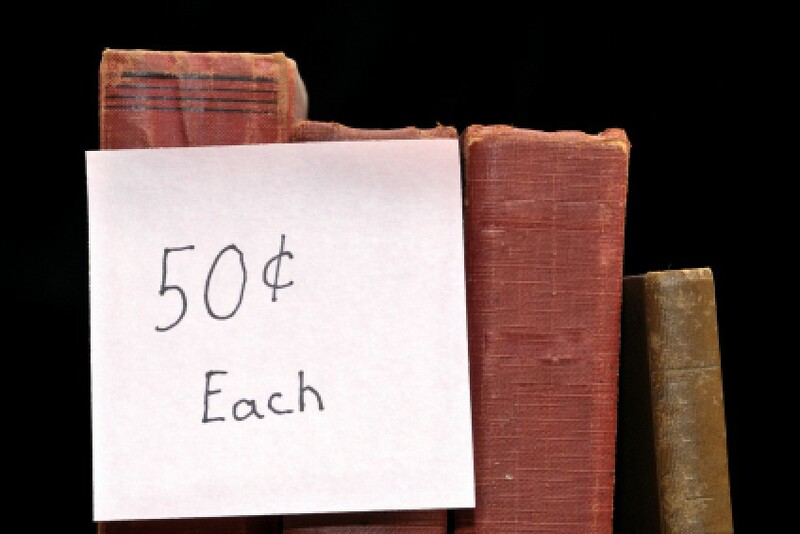 Your best bet might be trading them in at a used bookstore for store credit. The store "may" buy them for a lesser value than what the store credit would be but I wouldn't count on it. Best chance for the pawn shop or bookstore would be a town with a community college, college or university. More demand in general for that sort of thing. Your best bet for getting the value of the set in the long run might be to donate it to an organization that can give you a tax voucher and then claim that donation on your taxes. Doesn't put money in your pocket right now but it could possibly save you money next year. That is if you itemize your taxes. Here's a website, two of my friends have used to sell books, where they pay you for the books they want. You go to the website and enter the ISBN number of the book (like UPC). It tells you if they can use it or not. They pay higher than you might make if you'd sold them at a yard or garage sale. They pay by PayPal and even pay the shipping charges. Have any books laying around, just gathering dust? If you have a few minutes and would like to clean out your book shelves, you can try selling your used books at http://cash4books.net. From what I've read on the site, they are mostly interested in non-fiction, but you can check it out for yourself. The site and process is very simple. You log onto the site, put in the ISBN number of your books and they tell you immediately whether or not they are buying the ones you have. If they are, they tell you how much they will pay you and send you a postage paid mailing label which you can print off. The service keeps you well informed. They let you know when they receive your books and processing did not take nearly as long as I expected. I had a check within weeks. It's definitely worth a shot.